INCLUSIVE. Inclusive is our watchword and our mandate. REBSEA aims to include under its umbrella anybody or any company that Gives Back to their community in any way, shape, or form. 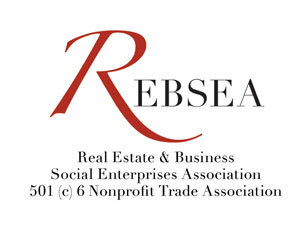 REBSEA aims to inform its members and its supporters about all of the organizations, whether for profit or nonprofit, who intend or realize a social benefit through their business. It is up to our members to decide if any of these companies or organizations are something they want to support or become involved with. In this way those business models with more merit will thrive and those with less merit will not. It is up to our members and supporters to decide. REBSEA wants to introduce you to each other so we can learn from each other and have the greatest pool of ideas and inspirations to draw from. REBSEA wants to tell its members and supporters about programs going on in different parts of the country that might be just perfect for their own community. There is far more happening in the realm of Social Enterprise than any one of us is aware of and by making us all aware of what is truly innovative and valuable we can help foster the growth of Social Enterprise. This is what we were created to do. Our goal is to help our members grow their businesses while increasing donations to nonprofits. One of the key ways to accomplish this is to provide the type of information and connections we are discussing. If you look above at the sectors of our society where great change is taking place in the direction of Social Enterprise you will see almost a void in the sector of the real estate industry. REBSEA Is filling that void by providing LEADERSHIP to bring the real estate industry into the spreading and powerful trend of Social Enterprise. We are a 'grass roots' movement of sorts because we are seeking members from the large real estate franchises as individuals rather than as a group. We want their agents to join REBSEA as individuals who are doing so because they are socially responsible. Yes, Giving Back is good for business and yes, it is good business. We hope to demonstrate this through our actions and our success in the marketplace, but it is not THE reason we are doing it. We are doing it because we are called to do so by our desire to help and support where there is need and pain. We want to demonstrate that you can not separate 'doing good business' from 'doing good' because without the sustainable business there is no opportunity to deliver that social benefit. It is about balance and it is about making social enterprise so much a part of commerce that you can no longer see where one ends and the other begins. JOIN US. TOGETHER WE CAN MAKE A REAL IMPACT! LEADERSHIP. JOIN US. TELL OTHERS ABOUT US. SPREAD THE WORD.